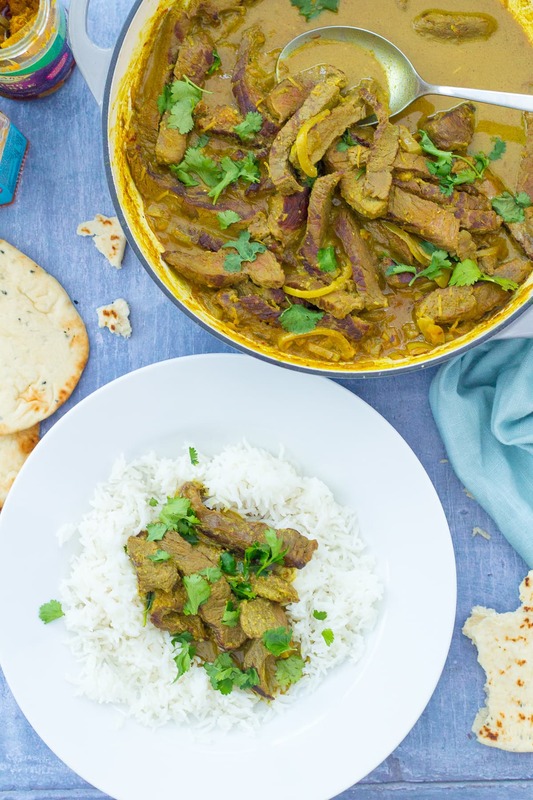 A deliciously easy way to use up your roast beef leftovers, this Leftover Roast Beef Korma can be whipped up in under 30 minutes – perfect for busy weeknights! No leftovers? No problem! This easy korma can be made with rump steak instead. What to do with Roast Beef Leftovers? Did you have a fab joint of beef at the weekend and are you now wondering what to do with the leftovers? Then you’ve come to the right place! I am a HUGE fan of leftovers recipes – I love to transform leftovers into something new and exciting. 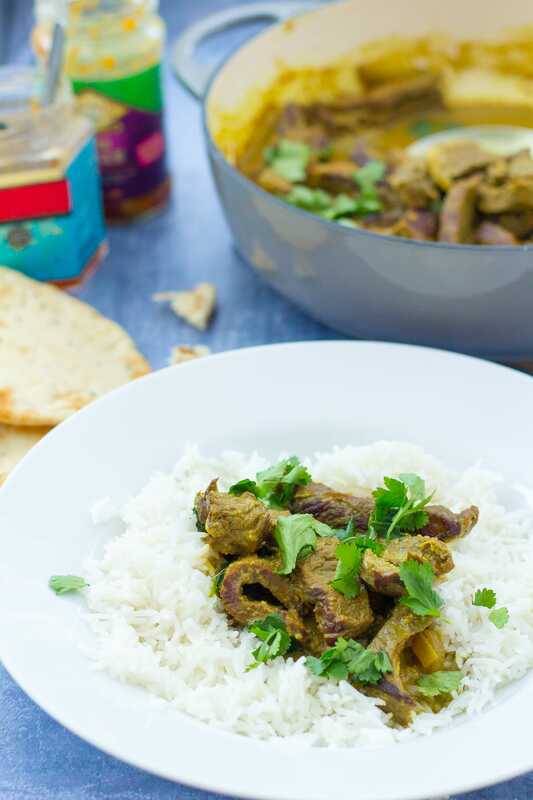 Or why not try my latest recipe – Leftover Roast Beef Korma? I love leftovers because they make such great easy peasy midweek meals – the job of cooking the meat to perfection has already been done, so you are already half way there! 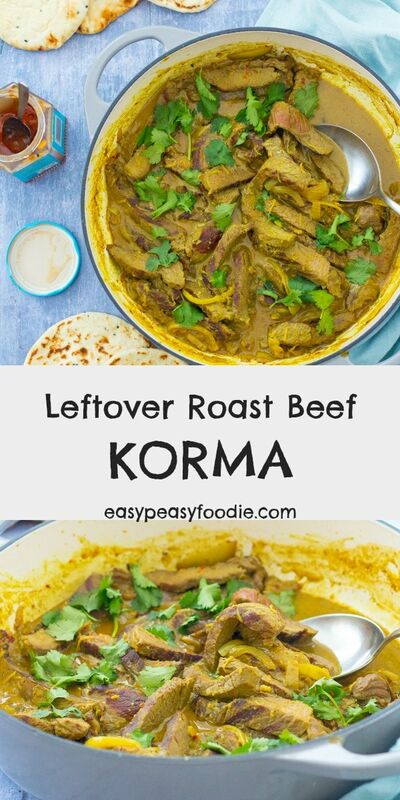 Like all my other leftovers recipes, this Leftover Roast Beef Korma is super easy to make! Simply fry a few spices and some onions to make a base, add the leftover beef along with some coconut milk and simmer until the sauce has reduced and the beef has warmed through – so easy! What if you don’t have any leftover roast beef? No leftover roast beef? No problem! Simply pan fry a couple of rump steaks to your liking, leave them to rest for 5-10 minutes while you make the rest of the curry, then chop and add to the curry for the last 5 minutes of cooking time. 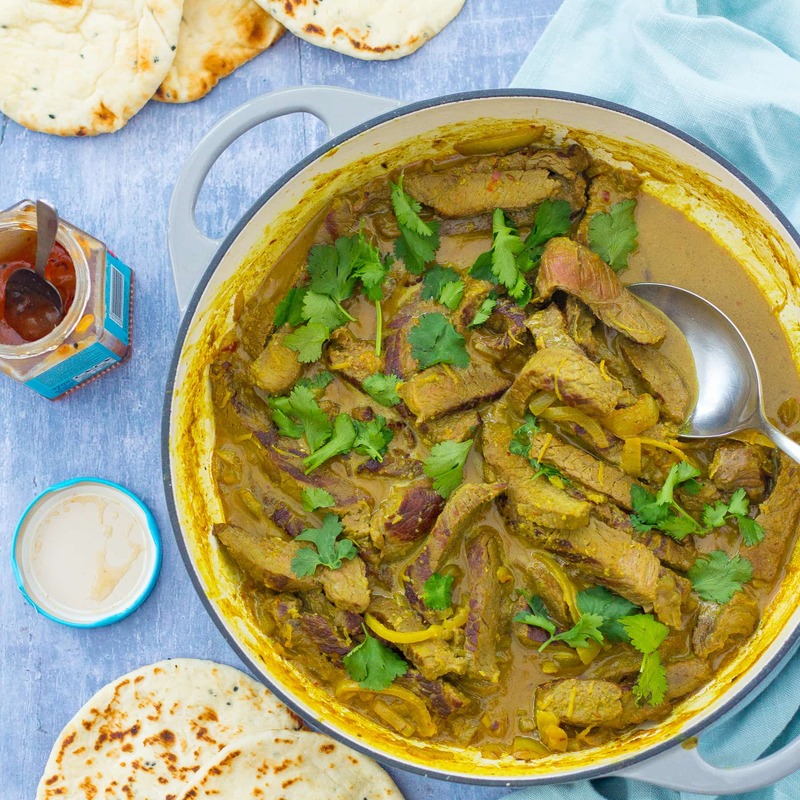 The result is out of this world – if you’ve never tried steak korma, you really need to! And the good news is, it only takes a few minutes longer to make than the leftover roast beef version. So still a great midweek option (though steak korma is definitely decadent enough to serve at the weekend too!). What to serve with Leftover Roast Beef Korma? My favourite accompaniments to this Leftover Roast Beef Korma are white basmati rice and/or naan breads. If you have a bit of extra time on your hands you could try making my Easy Homemade Naan Breads! If you want to make this a bit healthier, then why not serve it with a portion of Pilau Cauliflower Rice instead? You could also serve this Leftover Roast Beef Korma with brown rice, chapattis or regular pilau rice. What to drink with Leftover Roast Beef Korma? Probably the best match for this curry is a beer! I would recommend something like an IPA, which would go down a treat here. 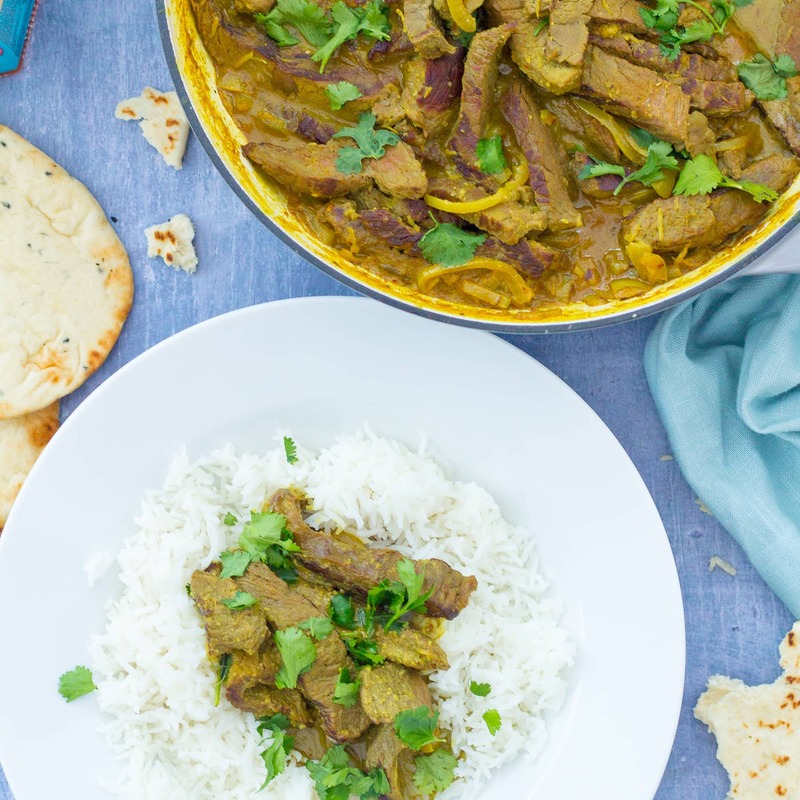 Beef Korma is a hugely difficult one to match with wine – the beef makes me want to go for red wine – but the spice and coconut milk make me want to go for white! Personally, I feel this Leftover Roast Beef Korma goes best with an zingy aromatic white such as Riesling or Sauvignon Blanc. If it has to be red for you, go for something juicy and fruity, such as a Grenache/Garnacha or a soft fruity Merlot. Put the oil in a wide, deep saucepan and add the sliced onions. Cook on a low heat, covered with a lid, for 5 minutes until the onions are soft, but not brown. Take the lid off and add the grated ginger and garlic together with the turmeric, garam masala, cumin and chilli. Cook for 2 minutes, stirring occasionally. Add roughly ¾ of the coconut milk and all of the beef, turn the heat up and bring to the boil, then turn the heat back down and gently simmer for 10 minutes. If you find the curry becomes too dry, you can add in the rest of the coconut milk. After 10 minutes, add the ground almonds and chopped coriander (cilantro) and cook for 1 more minute, then serve with rice and/or naans and garnish with a little more chopped coriander. If you don’t have any leftover beef, simply pan fry 2 rump steaks in a medium-hot pan for 3 minutes each side (or to your liking). Rest for 5-10 minutes, then chop into small pieces and add to the recipe for the last 5 minutes of cooking time. I’d never have thought of having a beef curry for some reason. This looks so tasty and a fantastic way to make the most of leftovers. I just love taking leftovers and reincarnating them as something completely different. 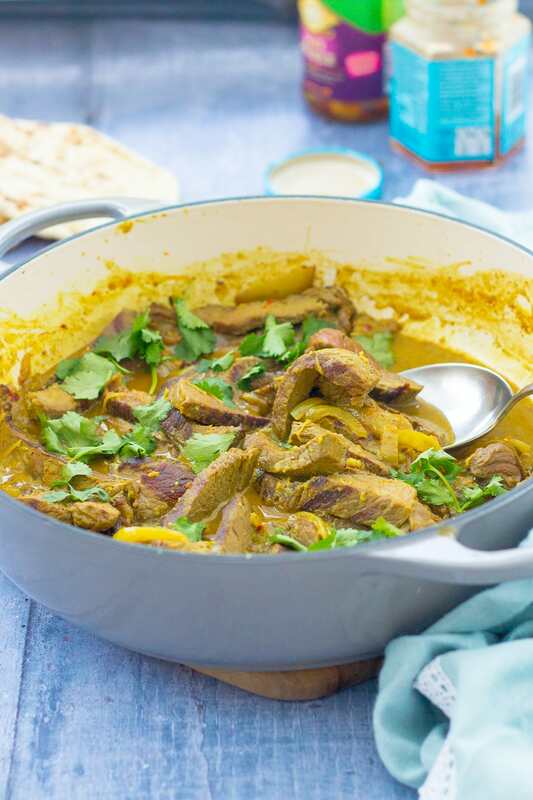 Your leftover roast beef korma is brilliant! I can’t wait to try this out. 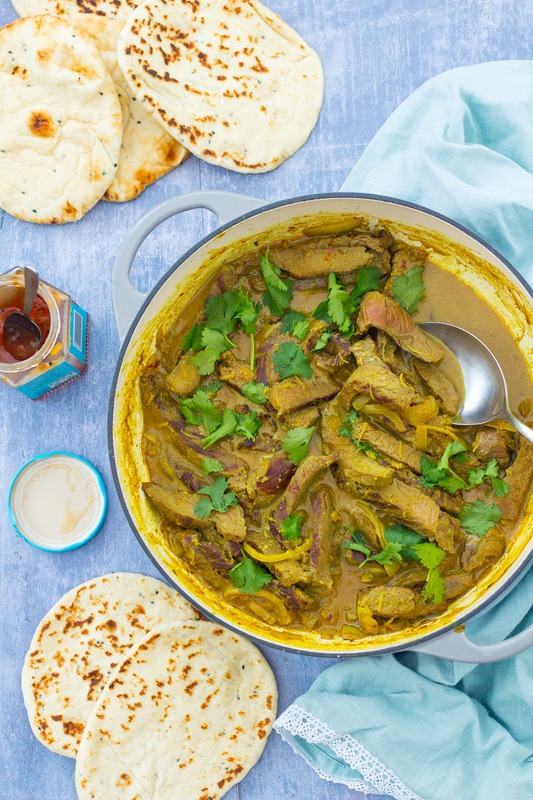 The Beef Korma looks gorgeous, but Steak Korma – why didn’t I think of that?! It sounds perfect! Found this while searching for a recipe for using leftover roast eye round – it sounds yummy! Do you think if I made it a few hours in advance of dinner time the beef would go chewy?